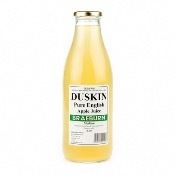 Duskin uses apples in single varieties, of which there are well over two thousand known varients. We believe that Kentish apples are the best for juice and we are very lucky to be in the Garden of England and source them locally. We currently produce 9 individual varieties with many winning local and nationally recognised awards. Just English apple juice in a bottle.